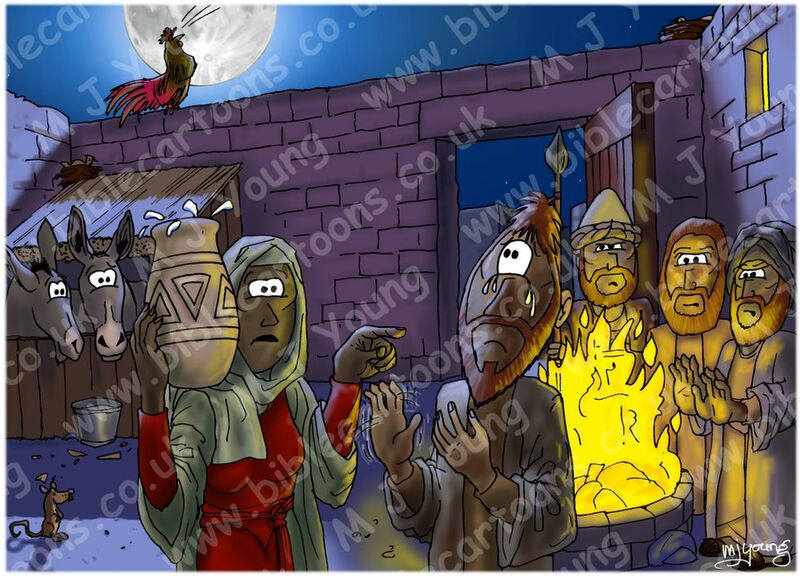 I’ve just uploaded the next cartoon in the Mark 14 sequence, this is scene 07, where Simon/Peter realises that he has denied the Lord Jesus Christ, just as Jesus had predicted he would. You can see the tears of realisation, frustration, anguish, sorrow, etc in Simon/Peter’s eyes. I thought it would be interesting to place the rooster as a silhouette against the bright disc of the full moon. The Passover festival is always conducted at the time of the full moon. I liked including the animals in this scene: the 2 donkeys in their stable; the rat, looking at the scene as he scurries about looking for food scraps; the rooster crowing on the courtyard wall; the 2 nesting birds, above the stable roof & on the wall. I am particularly pleased with the dramatic lighting: the warm glow of the fire pit versus the cool blue glow of the full moon. I hope you enjoy this scene as well!